Want to keep your handgun safe yet accessible? Then get a gun vault. 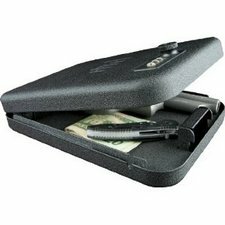 The GunVault handgun safe locks up your handgun safely but at the same time permitting accessibility in case of an emergency. Should an intruder enter your home, you can arm yourself in a few seconds by entering a 3 number combination. Now you can take action to stop the intruder with deadly force. These are great to have if you have young children and want to prevent an accident. If you have to have your firearms locked up then by all means buy one of these. As for my own opinion, I hate the idea of locking a weapon up that is for self defense. Just imagine yourself waking up at 2:00 am to the sound of glass breaking. You have to get out of bed, find the gun vault, enter the combination in total darkness and then grab the gun. This is really hard to do when you are not awake and startled by a loud noise. Seconds count when there’s an intruder in your house. It’s hard to focus when your heart is racing and hands shaking. I’ve been there. It’s scary as hell. I keep my Glock in my night stand, next to my bed. I just have to open a drawer and grab the Glock. I can do this without getting out of bed. This entry was posted in Gun Cases and tagged gun safe, gun vault by admin. Bookmark the permalink.